~ Surround a doorway ~ bookshelves surrounding the entry from a living room or office make creative use of what might otherwise be under-utilized wall space. Bookshelves, even if used for collectibles not books, are a pleasing addition around a fireplace as well. Do you have a cape style home with bedrooms upstairs? 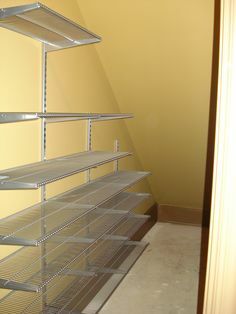 How about that wasted space in the knee wall…open it up for shelving or drawer space. ~ Take advantage of that space under the bed ~ if you’re trying to hide your extra storage space, what about using that wasted space under the bed? Take a quick trip to the store for shallow boxes and storage tubs that can be used for extra bedding, off-season clothes, or anything else that you may not need on a daily basis. Hats and mittens? Extra kitchen storage? What’s your preference? Extra space for sports equipment? Pet supplies? What would you use this space for? 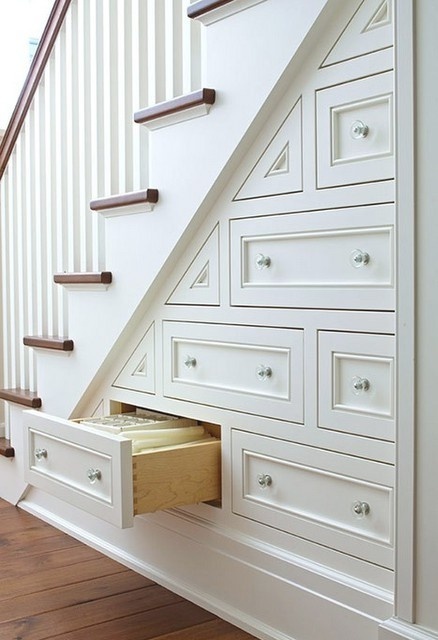 ~ What’s under your stairs ~ is it just wasted space that can serve so many of your storage needs. And it doesn’t have to be open space to do it. Cutting into the existing wall may be easier than you think, frame the new doorway and store away! ← Organize now, relax later! !